Amateur Radio Operators are often referred to as Ham Radio or simply hams. Each of the hams is given a call sign or station identifiers like WA2DHF, W3ABD etc. after they have passed their amateur radio examination. Hams circle of friends are not limited by distance as they can communicate with other hams from one corner of the world to another. This unique hobby enhances international relations as friendships are developed across the globe. CONSIDERATE - never knowingly operates in such a way as to lessen the pleasure of others. LOYAL - offers loyalty, encouragement and support to other amateurs and local clubs. PROGRESSIVE - with knowledge abreast of science, a well built and efficient station and operation above reproach. FRIENDLY - slow and patient operating when requested; friendly advice and counsel to beginner; cooperation and consideration in the interest of others. In order to become a ham, you will need to have a license and a station. A station consists of a radio and antenna. Each country has its own examination syllabus before you are allowed to operate the station. Each higher class gives the amateur more privileges in return for the skills learned to pass the ham radio exam. Help is easily available in preparation for the examination. If you are in the United States, the ARRL or American Radio Relay League has the best materials and resources to help you. Once you have passed the examination, you are allowed to assemble the station and start operating. However, always adhere to the country code and regulation when you start building the station. 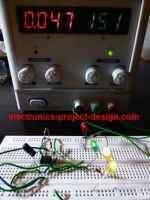 This simple code practice oscillator project for beginners to Continuous Wave Morse Code uses a 555 timer to generate a dit or dah sound when the key is pressed.